Burma's detained opposition leader Aung San Suu Kyi is suffering from low blood pressure and dehydration and is barely eating, her party spokesman says. Nyan Win said they were extremely worried about the 63-year-old Nobel Laureate's health. A medical assistant has placed Ms Suu Kyi on an intravenous drip. Her own doctor was reportedly detained after visiting her earlier this week. 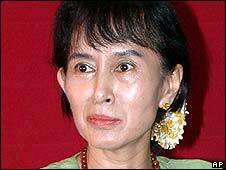 Ms Suu Kyi She has been under almost permanent house arrest since 1990. It followed the victory of her National League for Democracy (NLD) in a general election in 1990. The junta has refused to allow the party to assume power. Ms Suu Kyi's latest period of detention is due to expire at the end of May but the authorities have not yet said if it will be extended. "We are very concerned about her health and security conditions," Nyan Win of the NLD told the BBC. He said Ms Suu Kyi had suffered a loss of appetite and had gone three to four days without eating. As a result, her blood pressure had dropped and she was showing symptoms of dehydration. Nyan Win said the party was closely monitoring the situation, and would decide next week whether to press for greater medical treatment for Ms Suu Kyi. Nyan Win said it was not clear why physician Tin Myo Win had been arrested last Thursday. He speculated that it could be linked to the arrest on Tuesday of a man carrying a US passport who swam across a lake to the property. 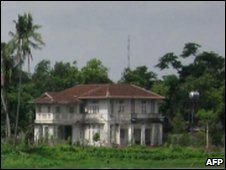 About 20 police are reported to have entered Ms Suu Kyi's house on Thursday morning. It followed reports that an American, identified as John William Yeattaw, had managed to breach tight security to swim across Inya Lake and enter Ms Suu Kyi's house secretly on Sunday. He was arrested after swimming back across the lake late on Tuesday. Such an incident would be the first time someone has broken into Ms Suu Kyi's compound.